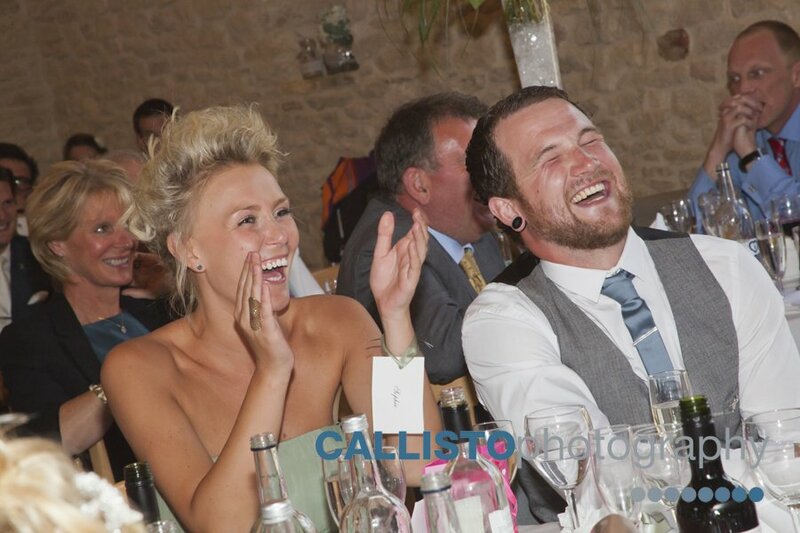 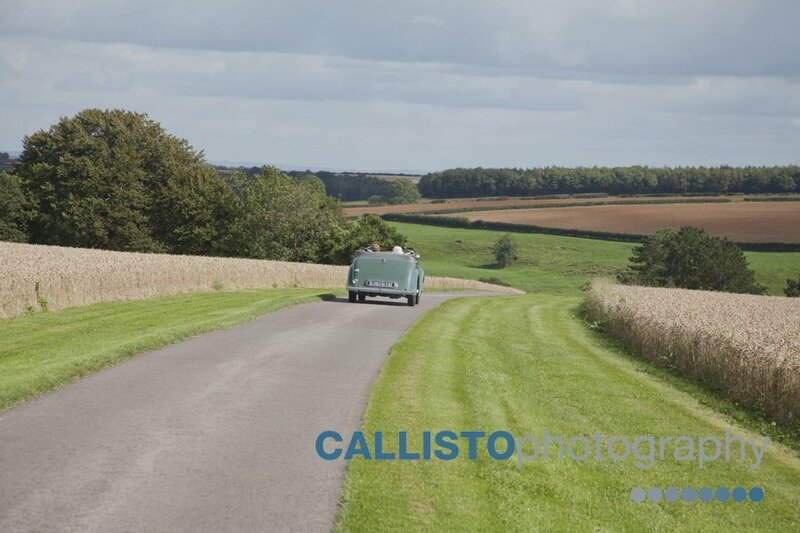 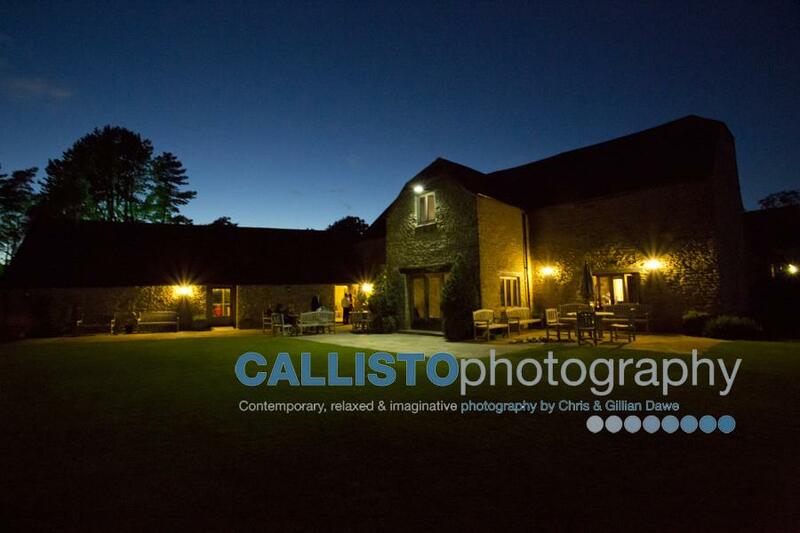 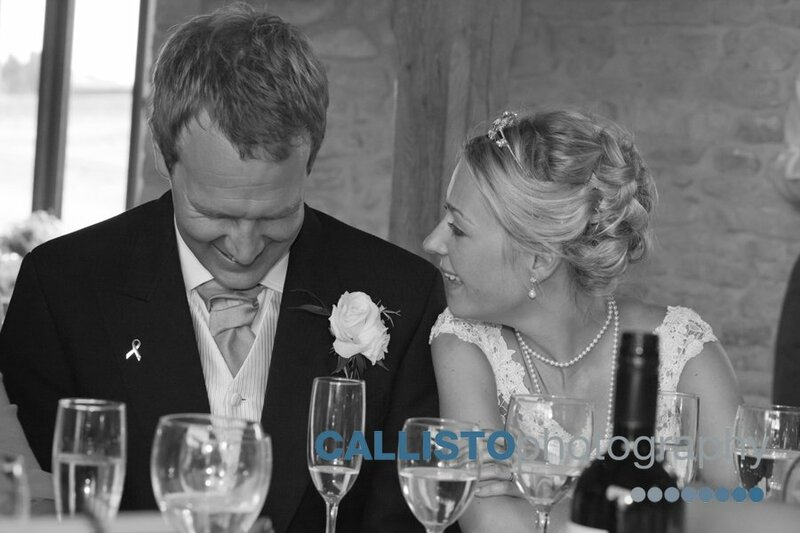 Kingscote Barn is one of our favourite venues and we returned to the Barn for Rebecca & Chris’ wedding reception. 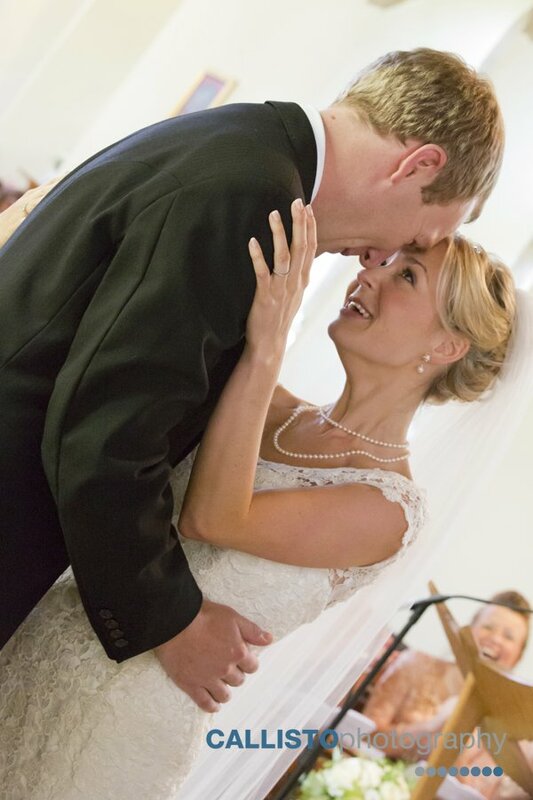 We had a real déjà vu moment when we arrived at Becky’s parent’s house, we entered only to see Amy, a guest from last week’s wedding. 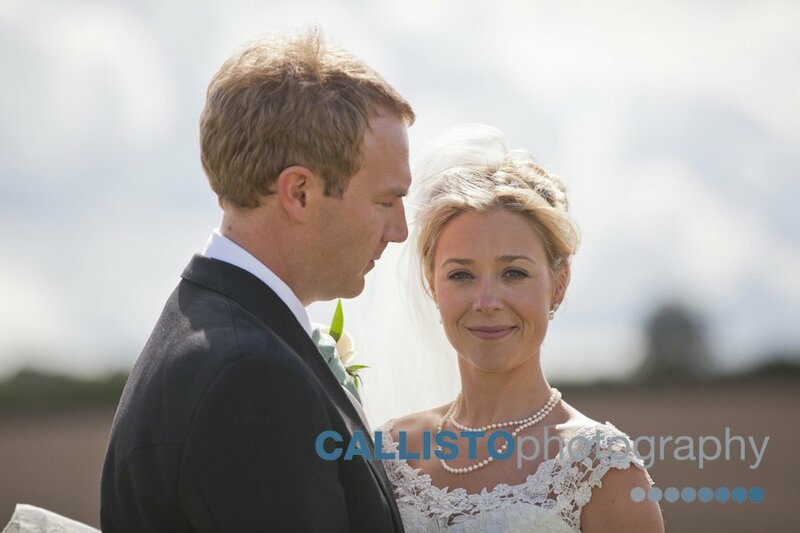 We had chatted to her and she did mention she had her brother’s wedding to go to soon but we never imagined it would be Chris. 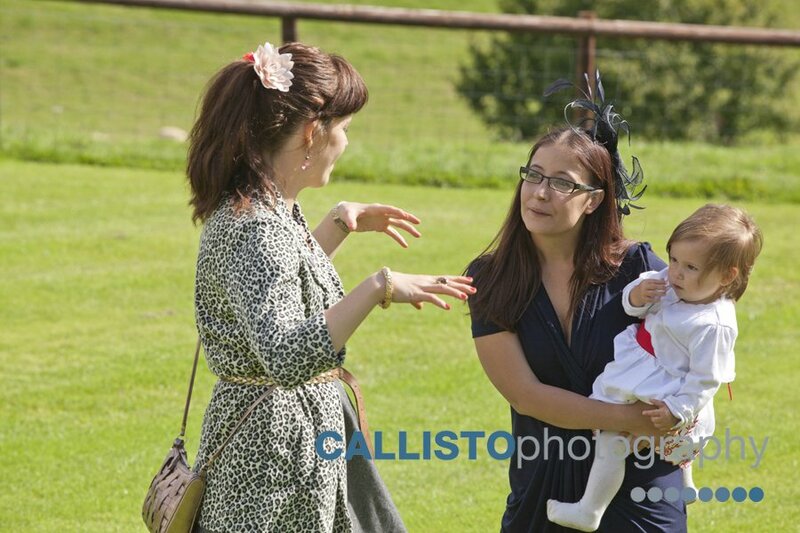 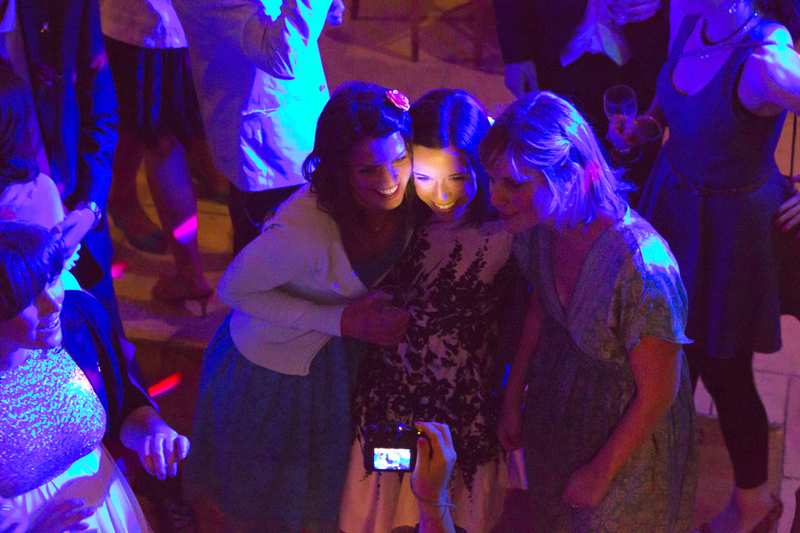 It was a very funny moment especially the look on Amy’s face when she saw us too! 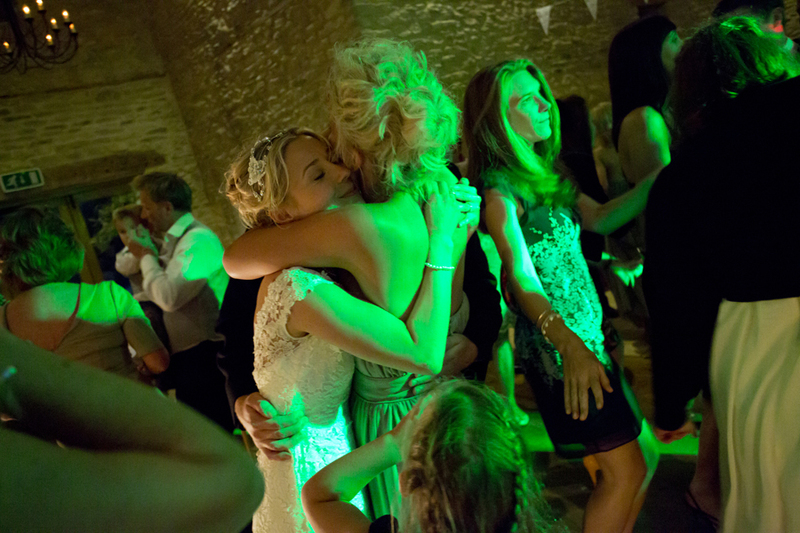 Becky and her bridesmaids, Ellie, Sophie & Lily, were all getting ready in the living room which meant I could really capture the buzz and excitement of the morning. 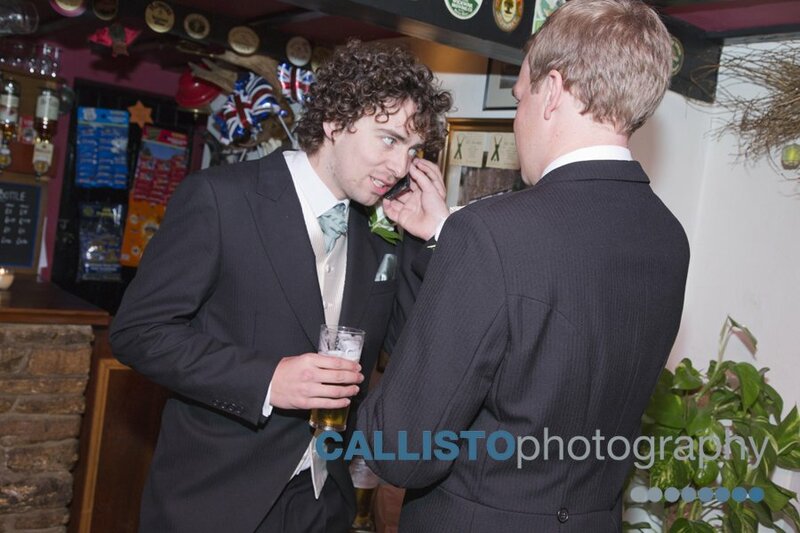 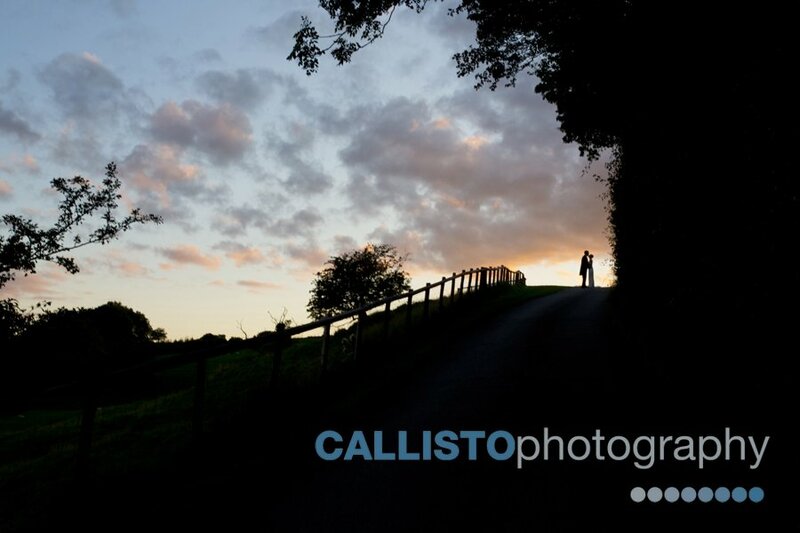 Chris had already left to photograph Chris (yes another one) walking from ‘The Hit or Miss’ pub (a reference to cricket, not his forthcoming wedding) to the church. 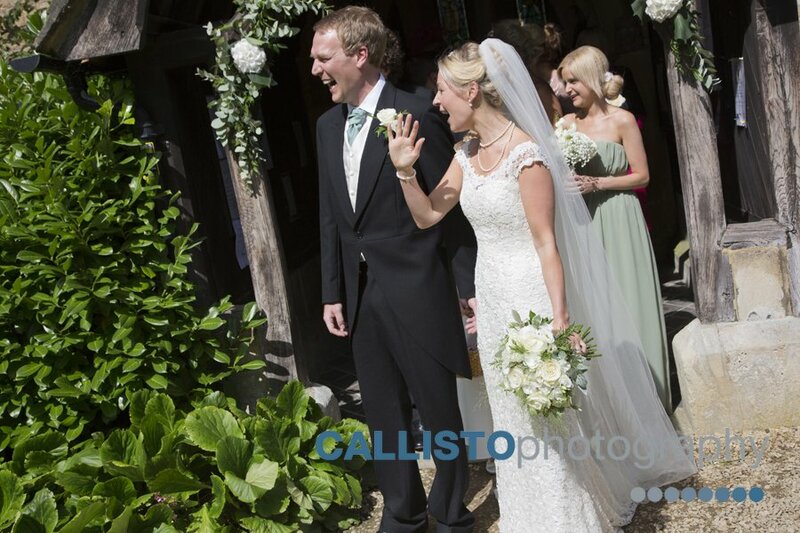 Becky’s hair & makeup was perfect (thanks to Jyn San), she looked like a beautiful English Rose & was dressed in an amazing Sassi Holford fishtail gown with full length lace overlay, buttoned down the back. 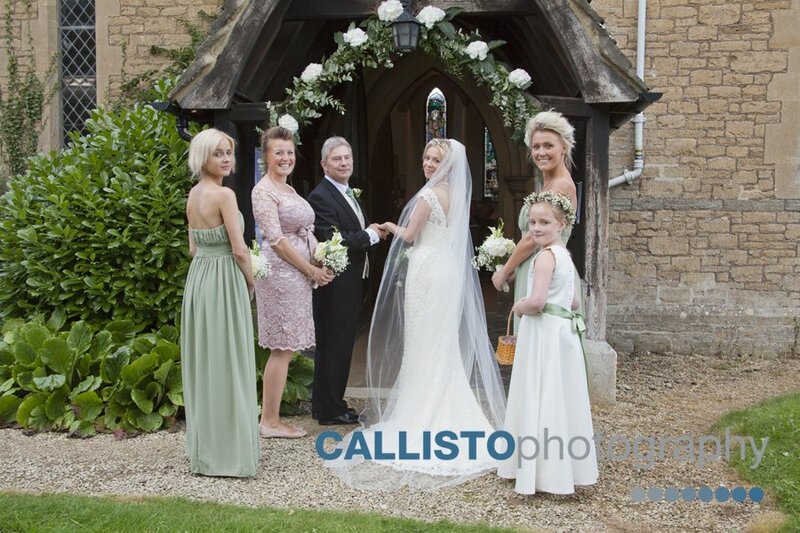 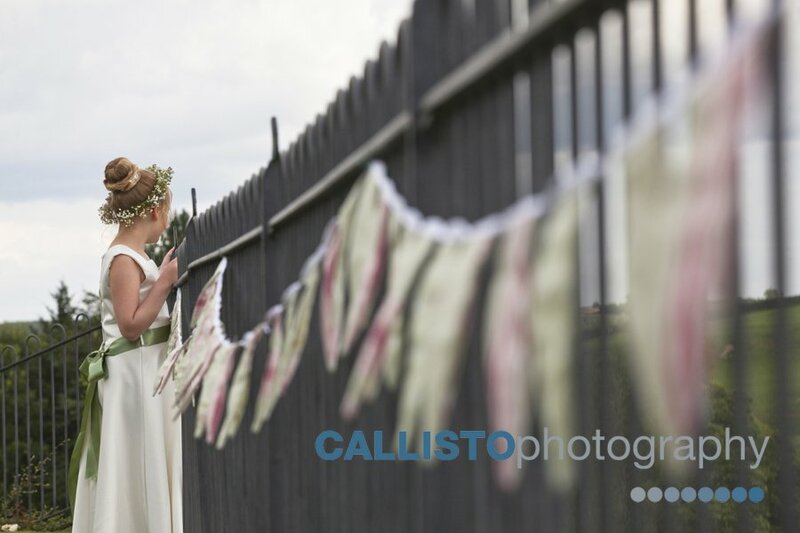 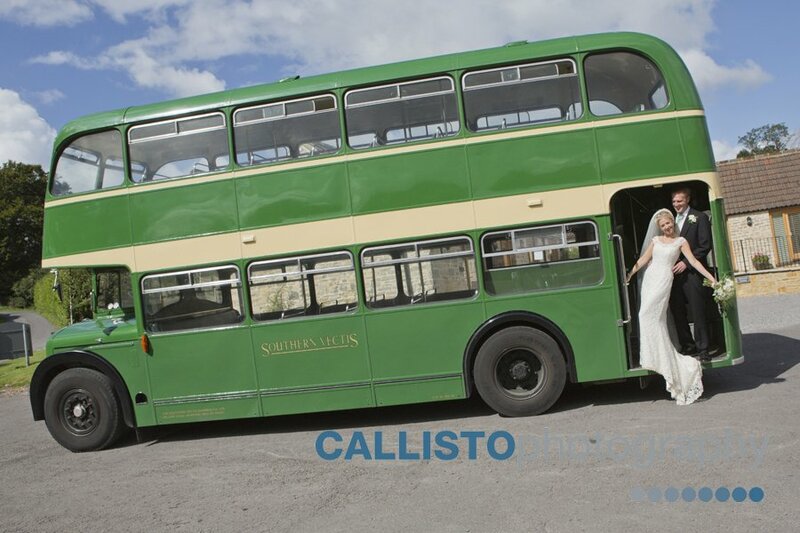 Her bridesmaids were wearing a sage green colour which complemented her look perfectly. 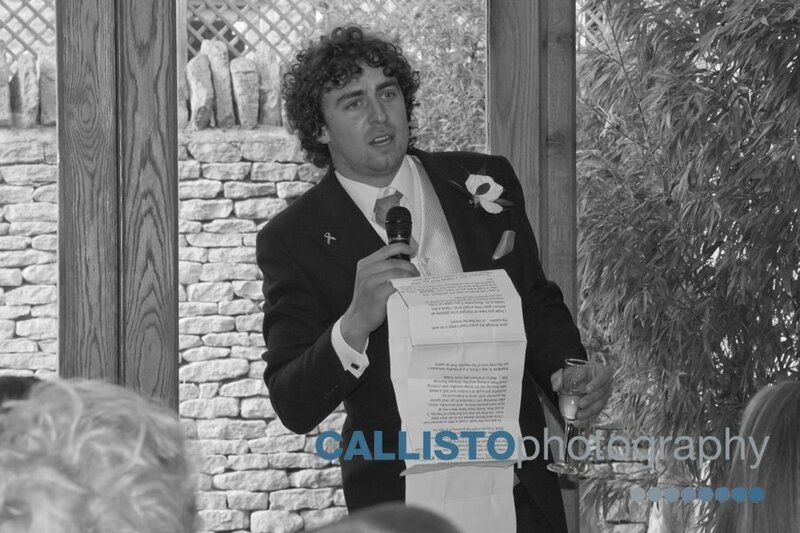 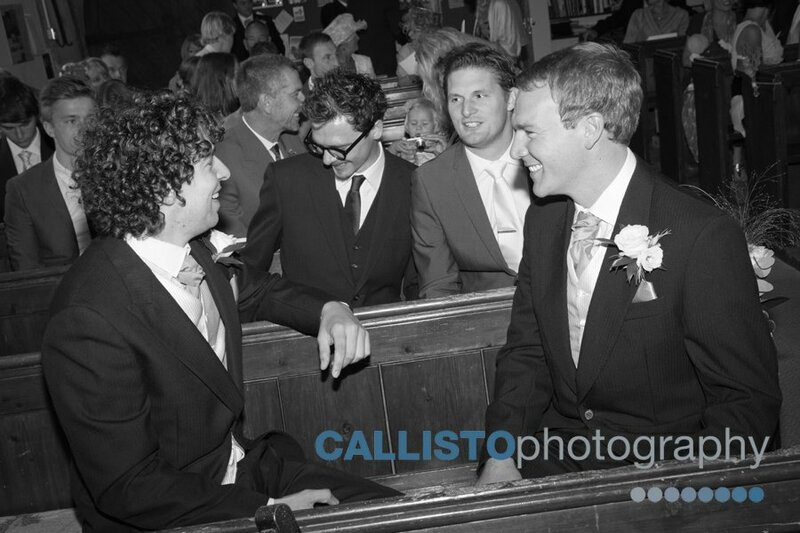 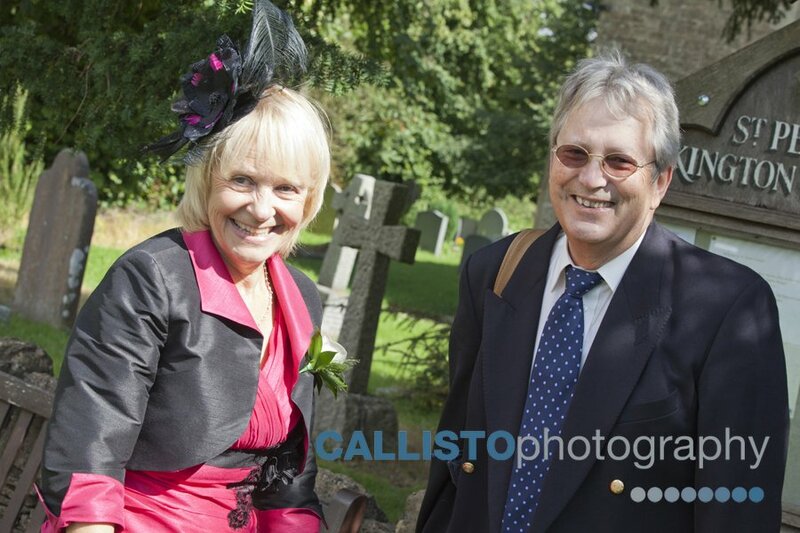 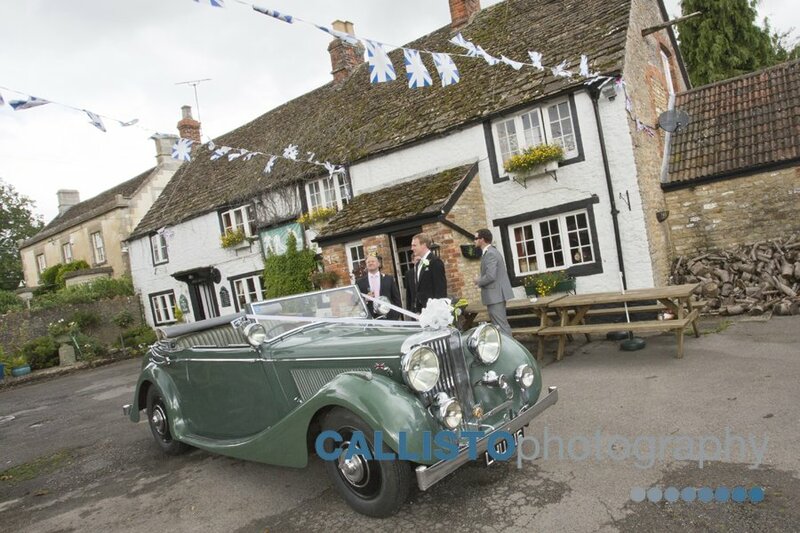 The ceremony was held at the quaint village church of Kington Langley; would all the guests fit into it I wondered? 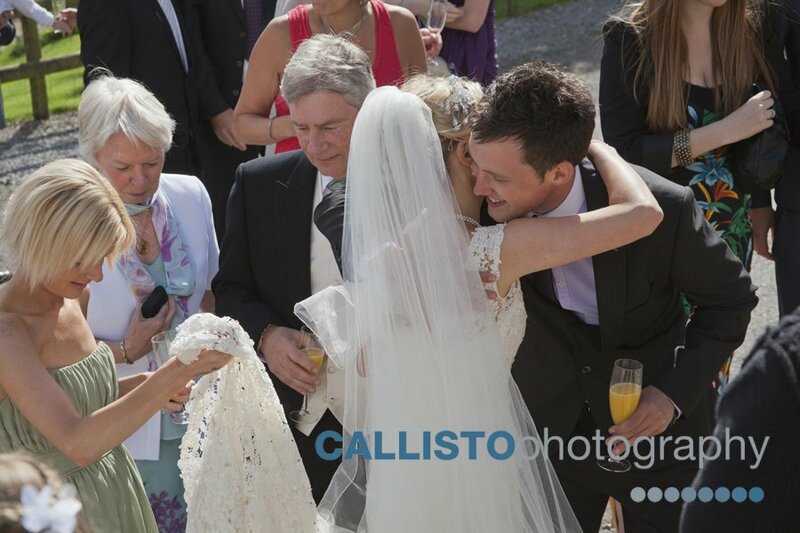 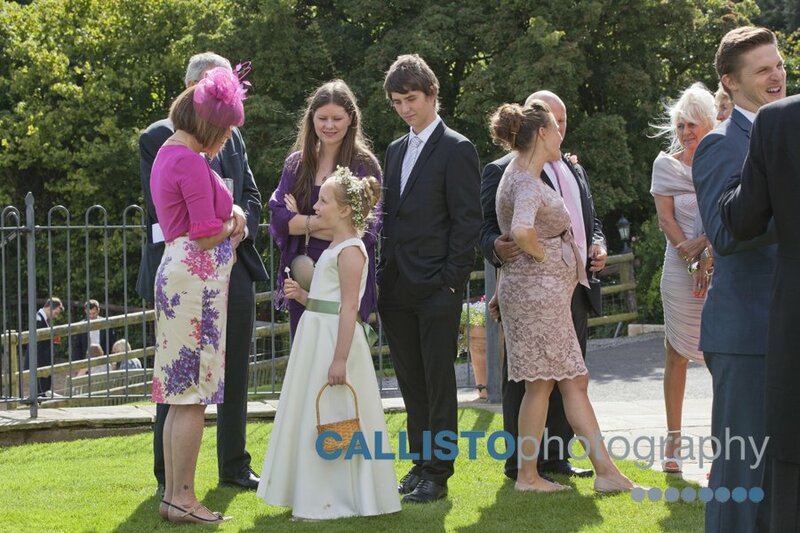 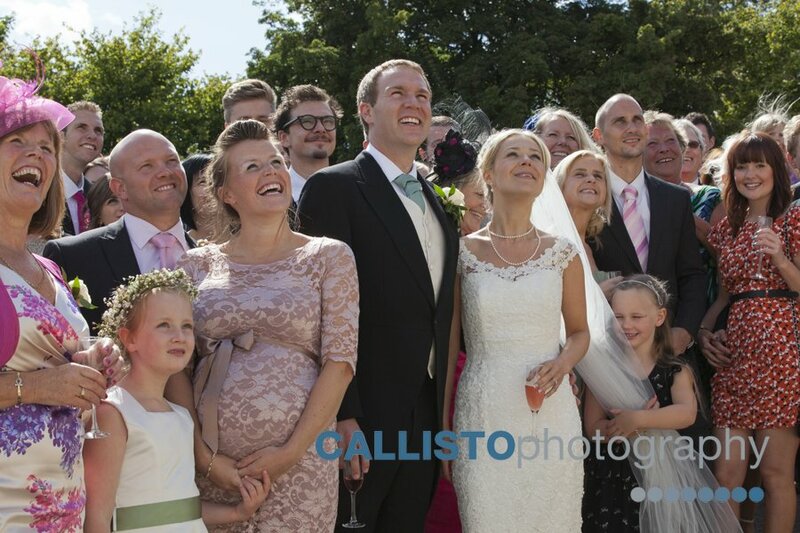 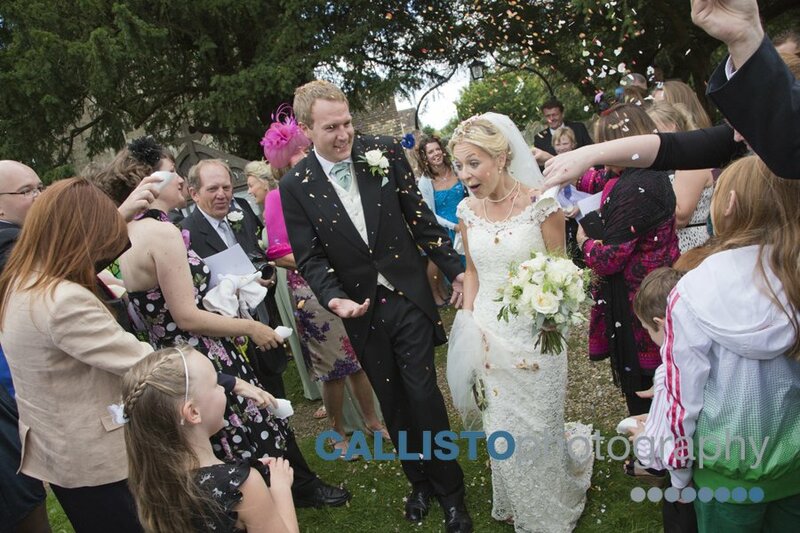 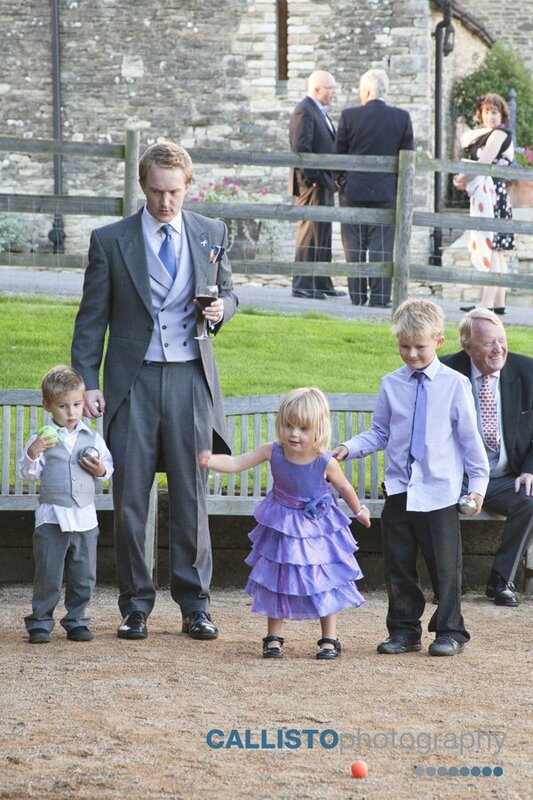 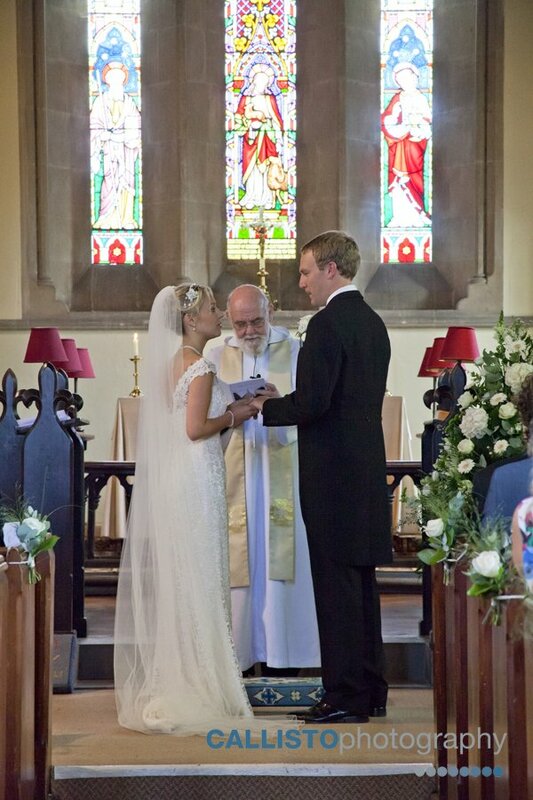 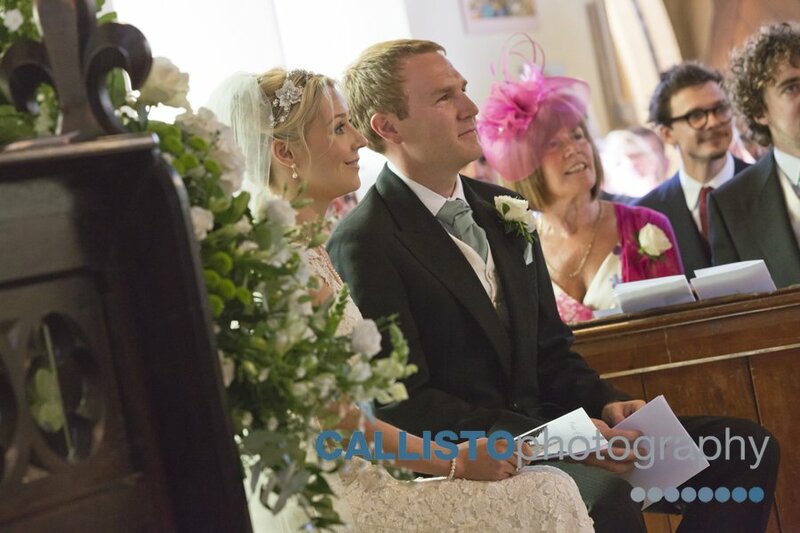 After the ceremony, Becky & Chris were greeted by lots of tiny, grinning faces of children all clutching confetti. 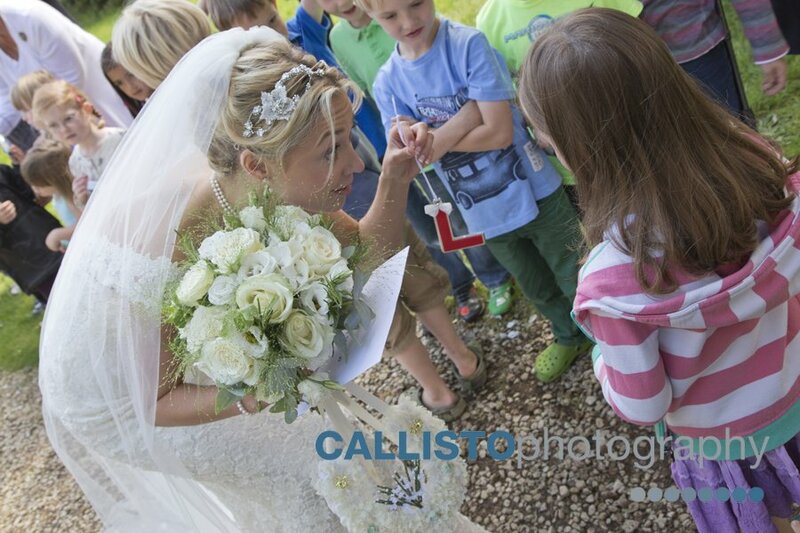 Becky is a primary school teacher and most of her class had turned out to cheer them on and of course, throw their confetti. 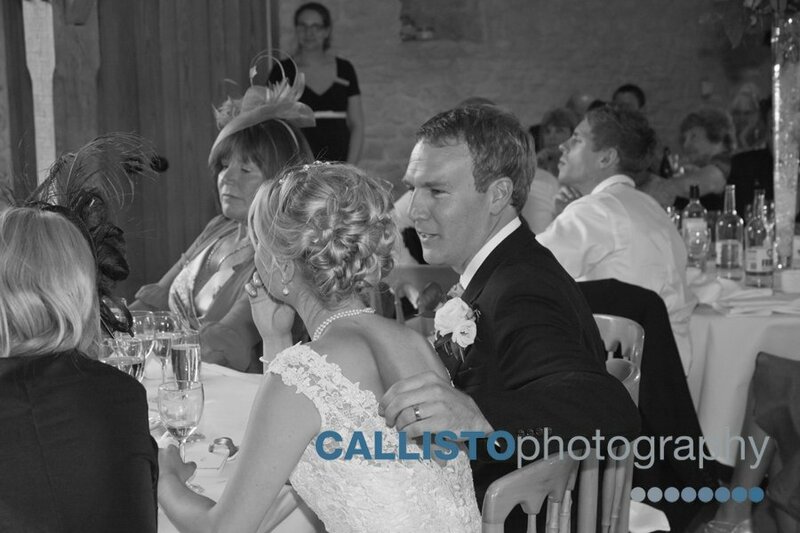 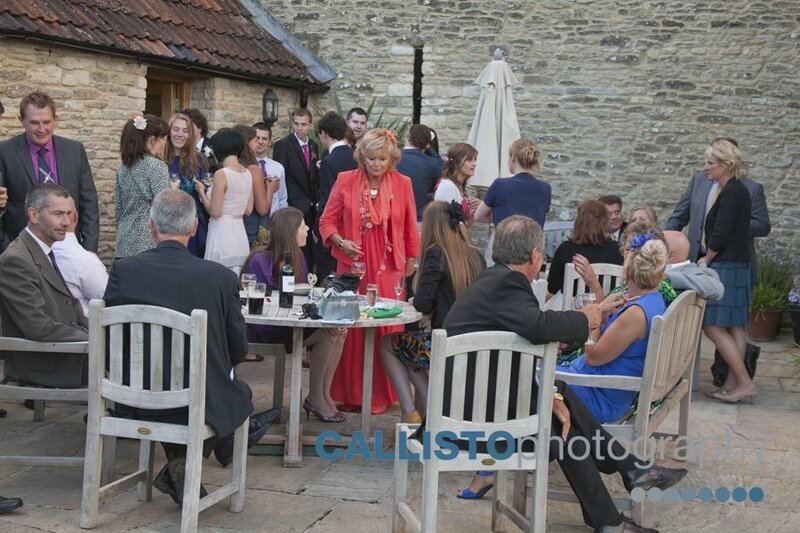 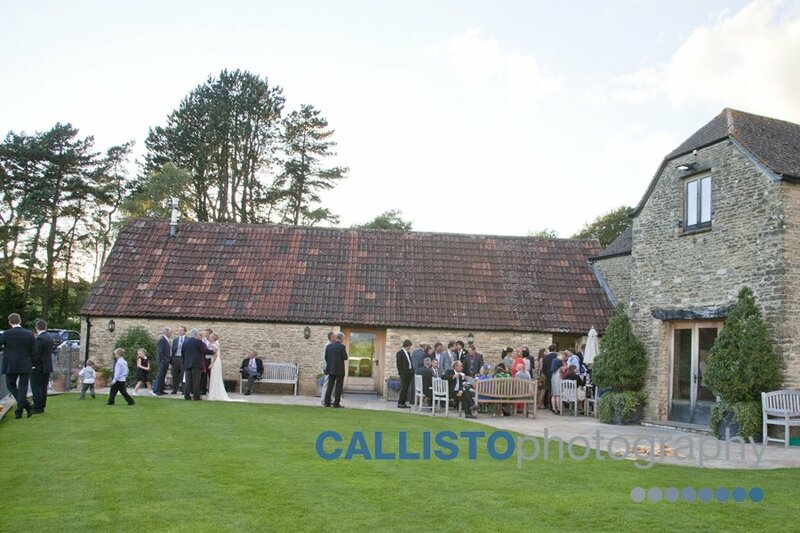 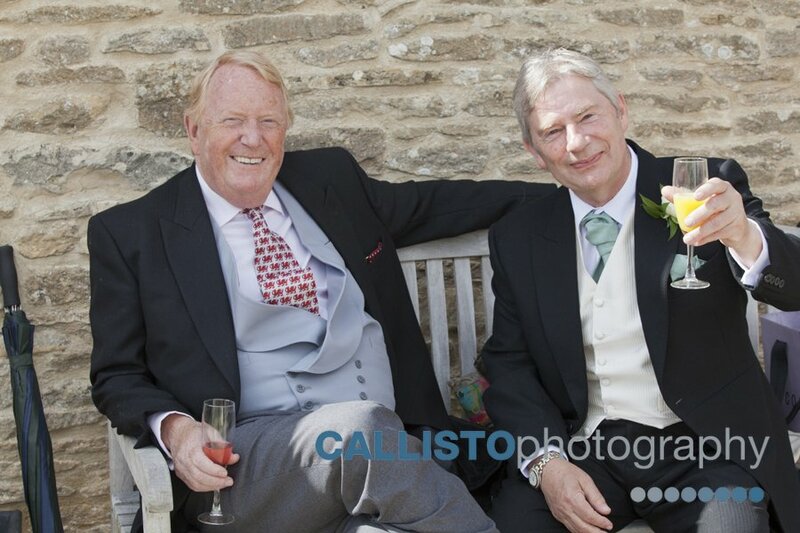 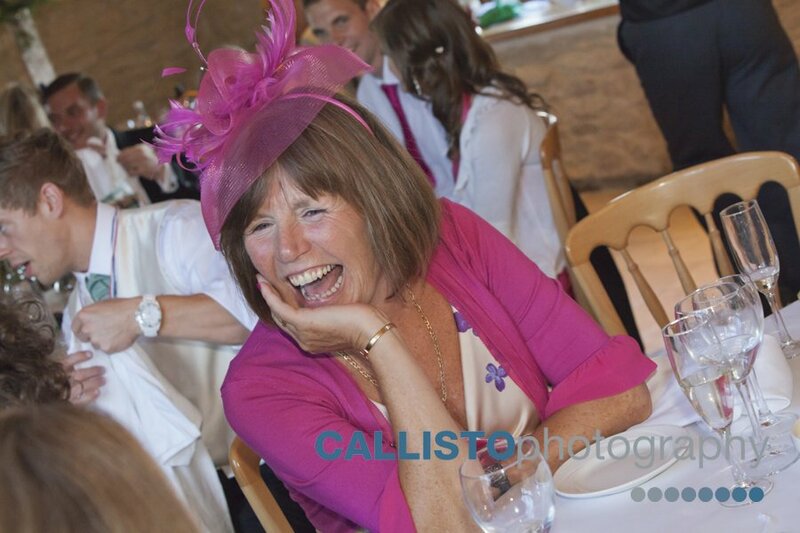 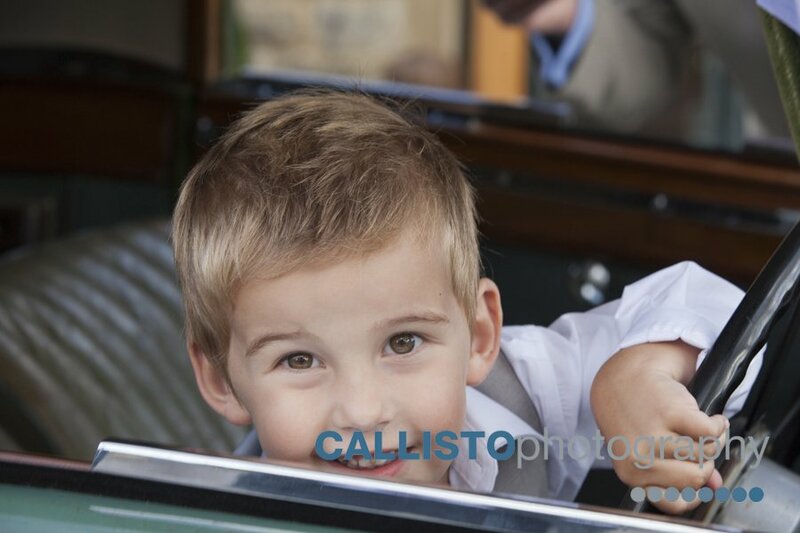 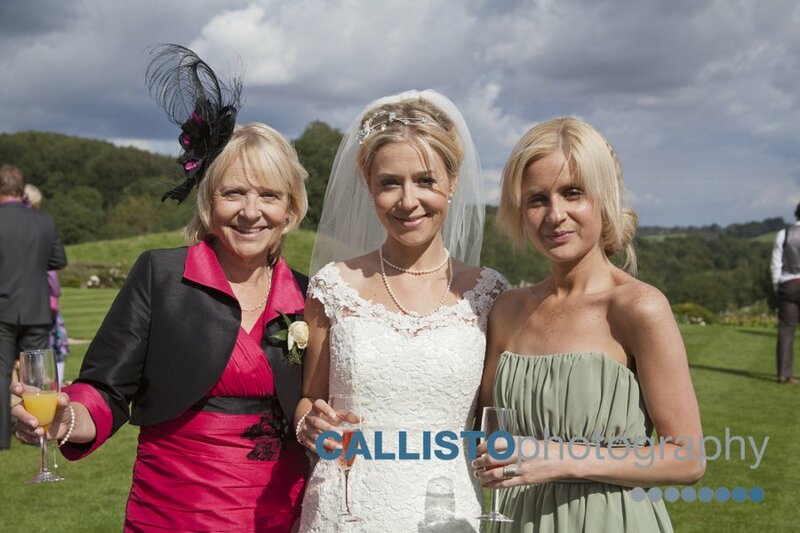 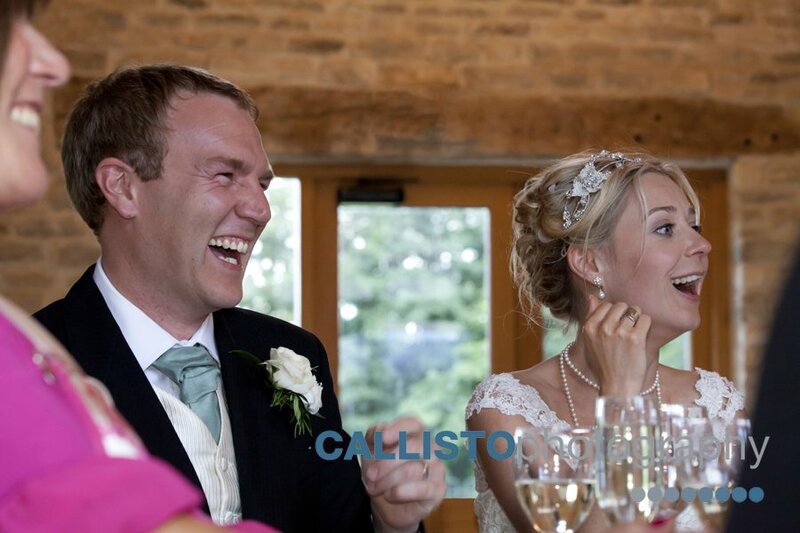 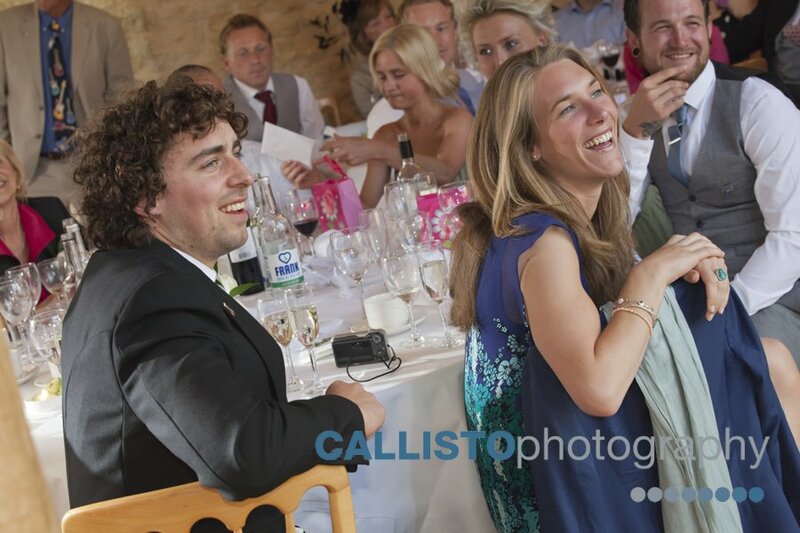 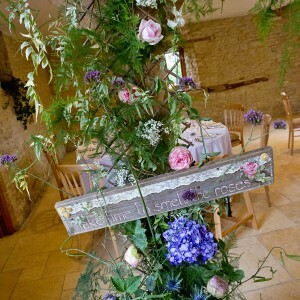 The reception was held at Kingscote Barn; a beautifully restored barn in the Cotswolds and one of our favourites. 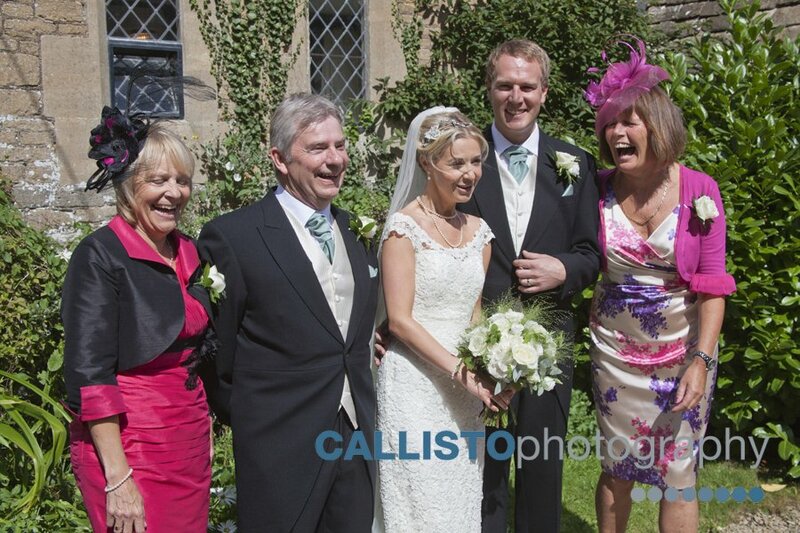 As friends and family were entertained by The Moonloungers, we whisked Becky & Chris off for some photos. 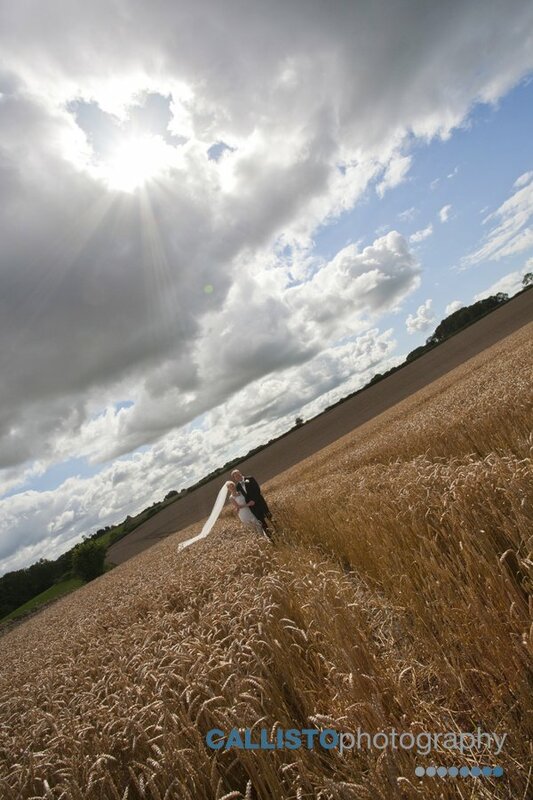 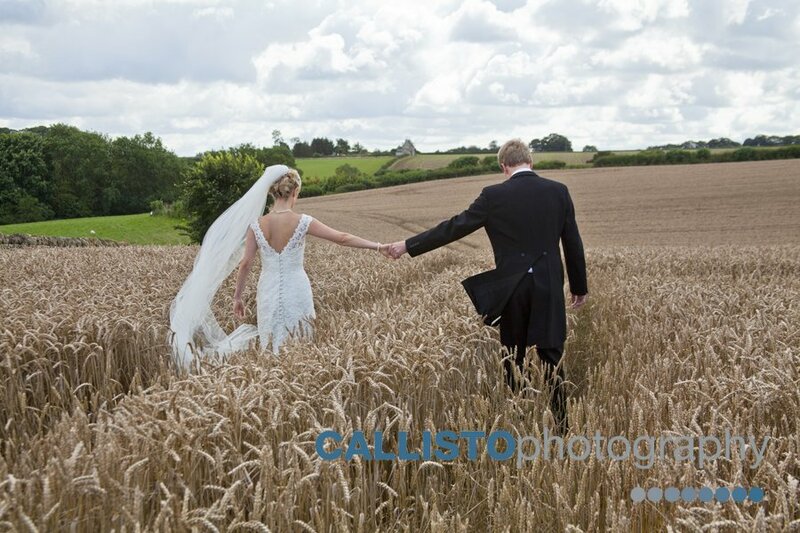 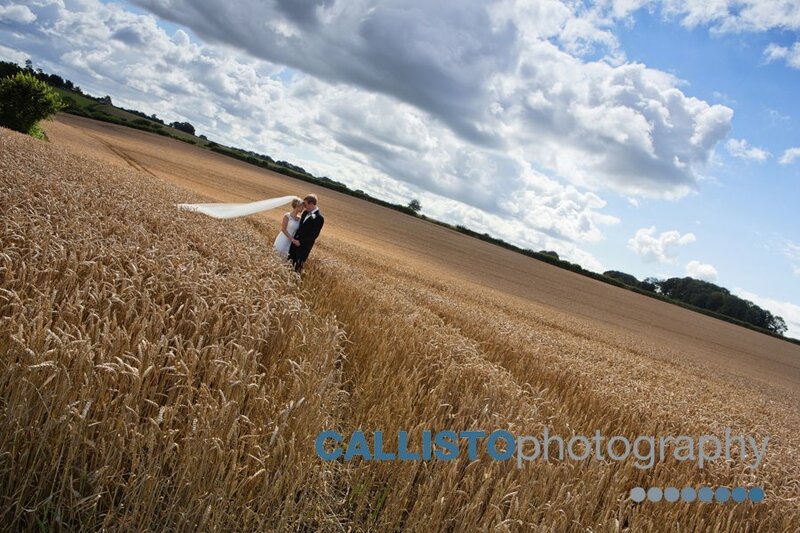 Becky was eager to get ‘into the cornfield’ and she certainly did that, no messing, straight in there and as the wind caught her veil and the sun danced on the golden corn, we got some truly romantic photos of the happy couple spending some quiet time (and lots of giggles) together. 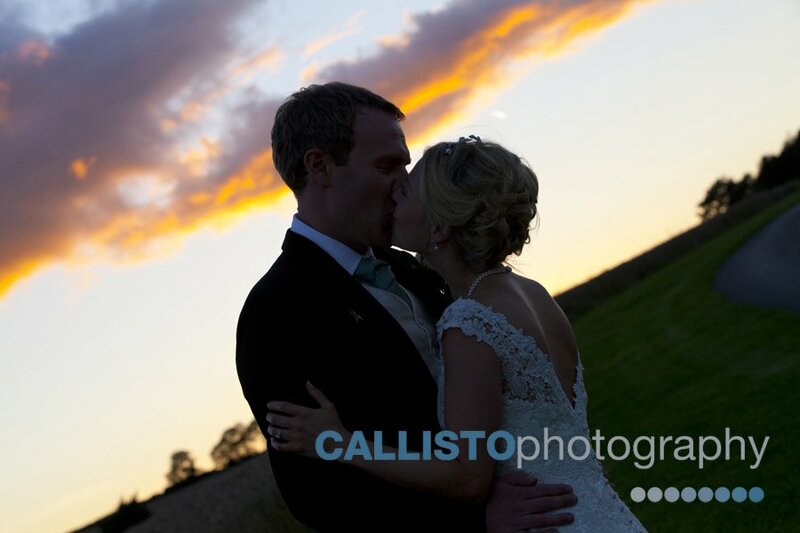 Becky & Chris have to be one of the most romantic couples we have photographed this year, they just wouldn’t stop kissing & cuddling! 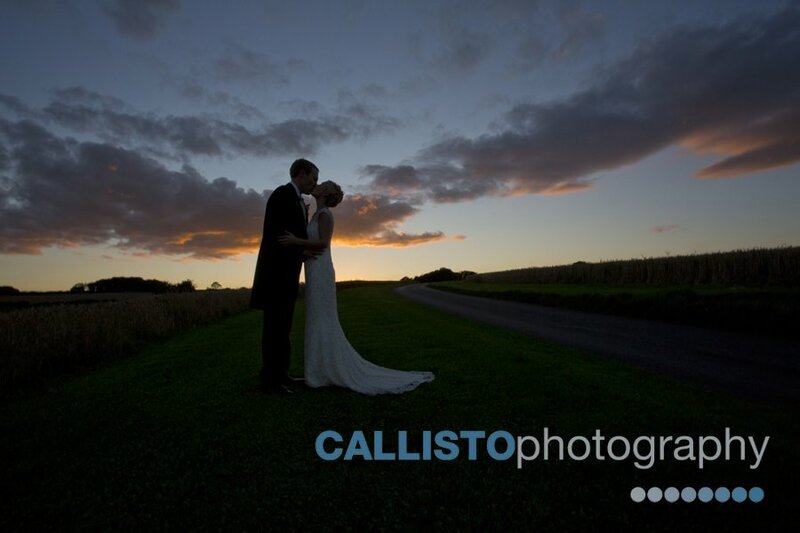 We also took some atmospheric sunset shots, reminiscent of the film ‘Gone with the Wind’; a silhouette photo of them standing on top of the hill with the beautiful sunset behind them, all very romantic. 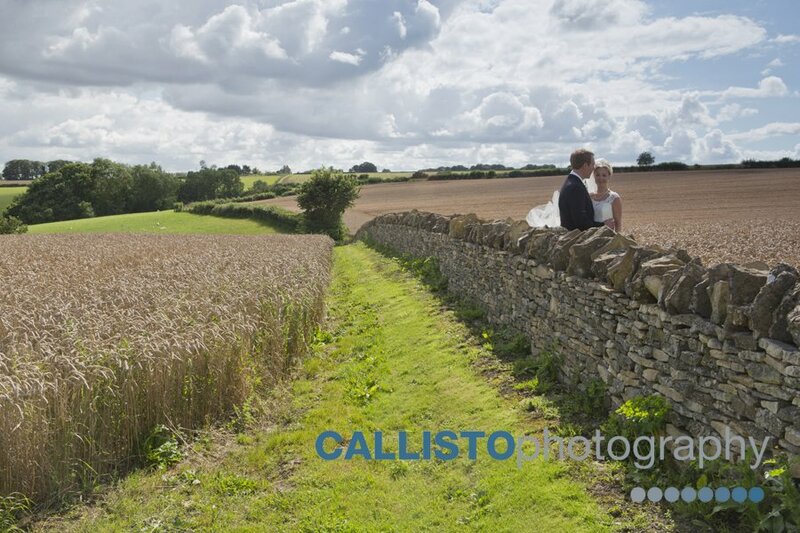 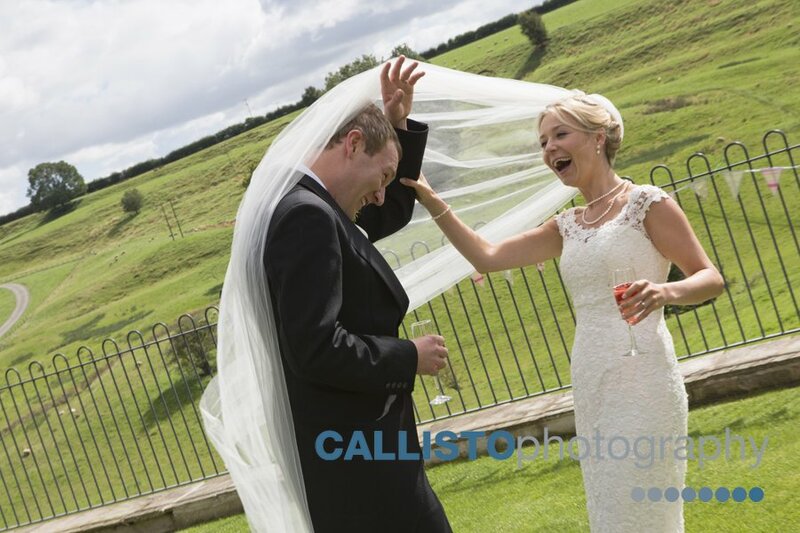 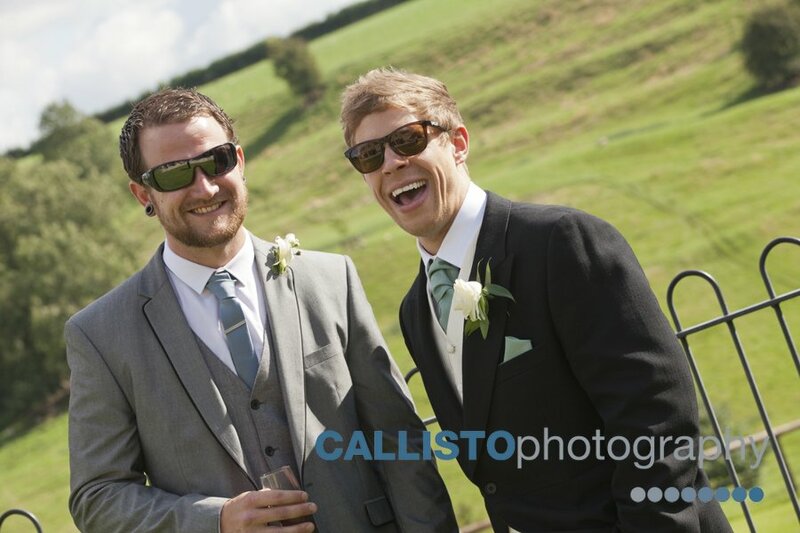 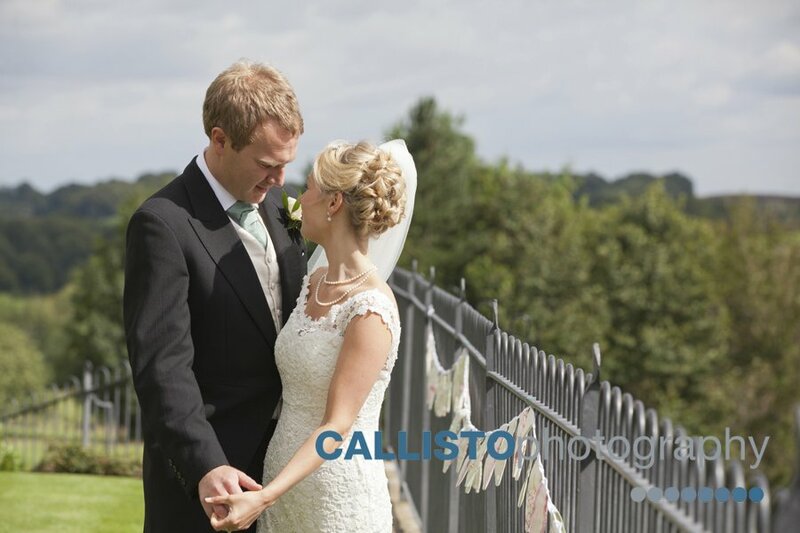 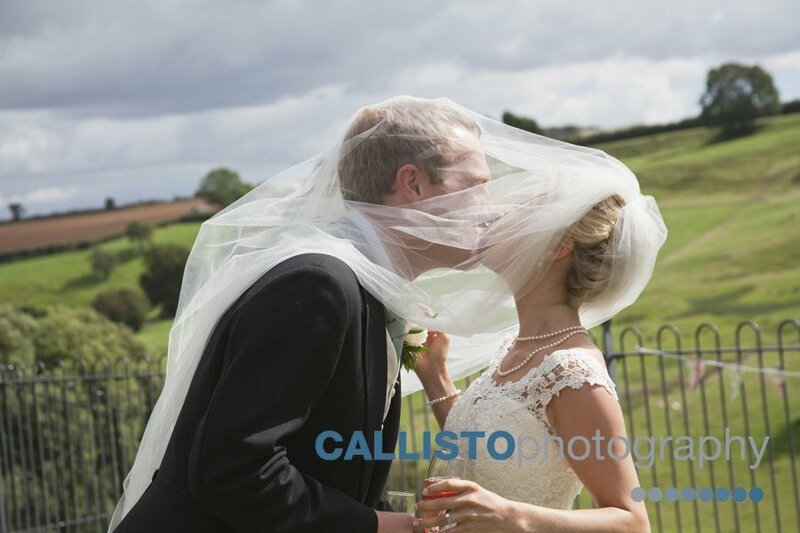 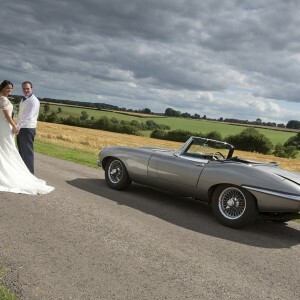 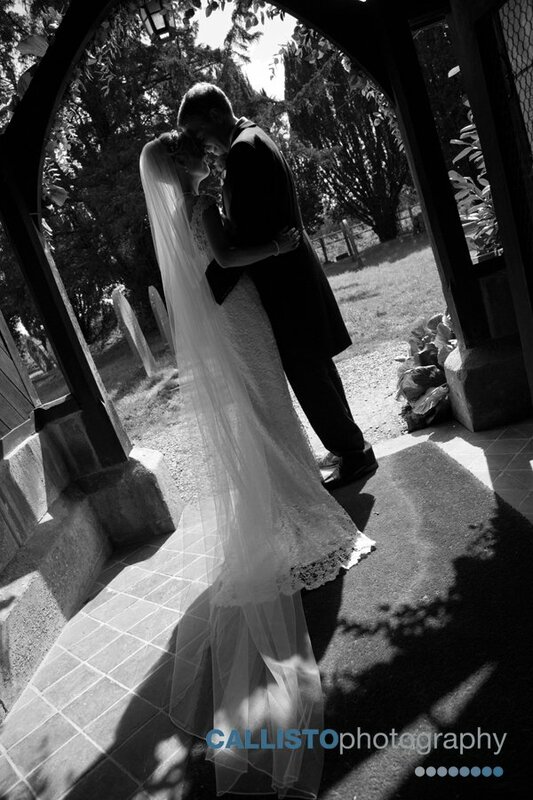 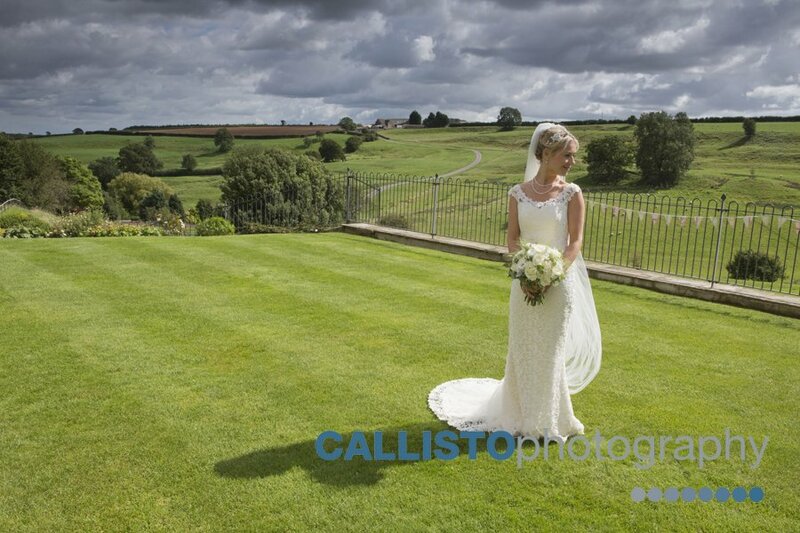 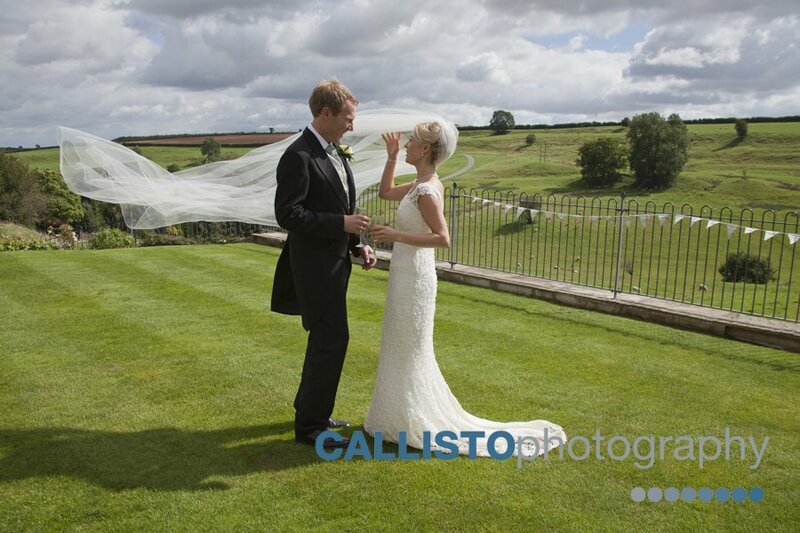 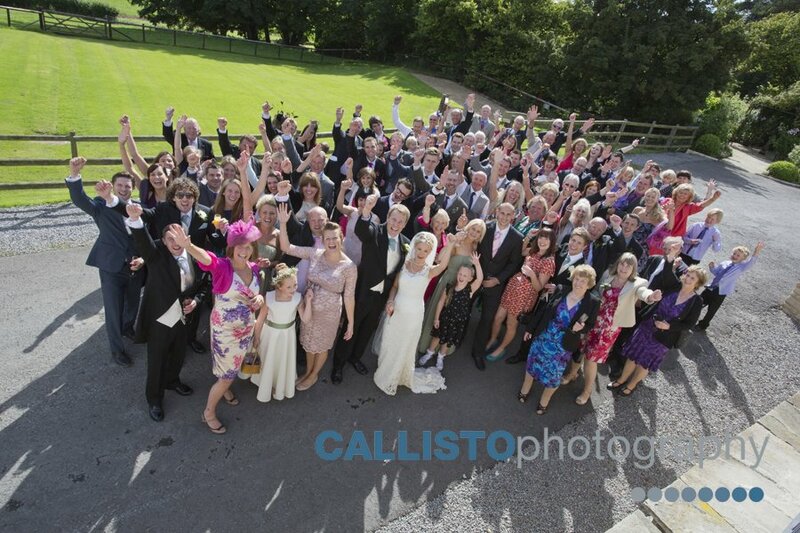 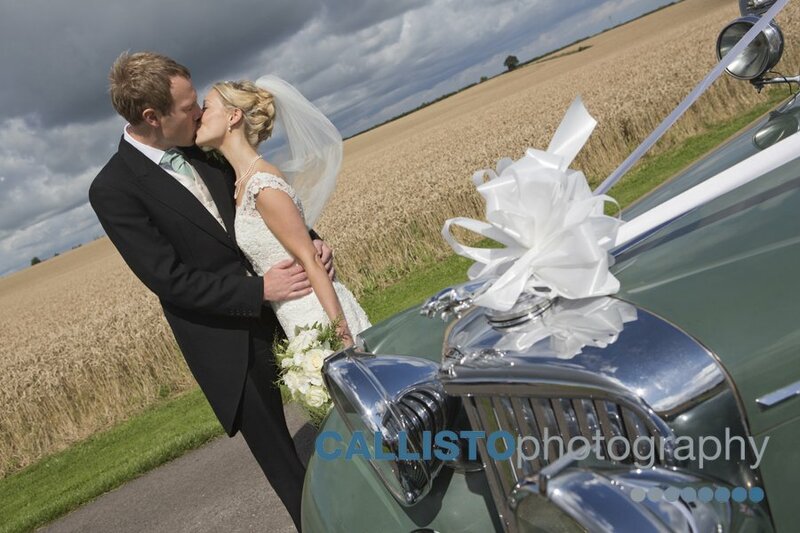 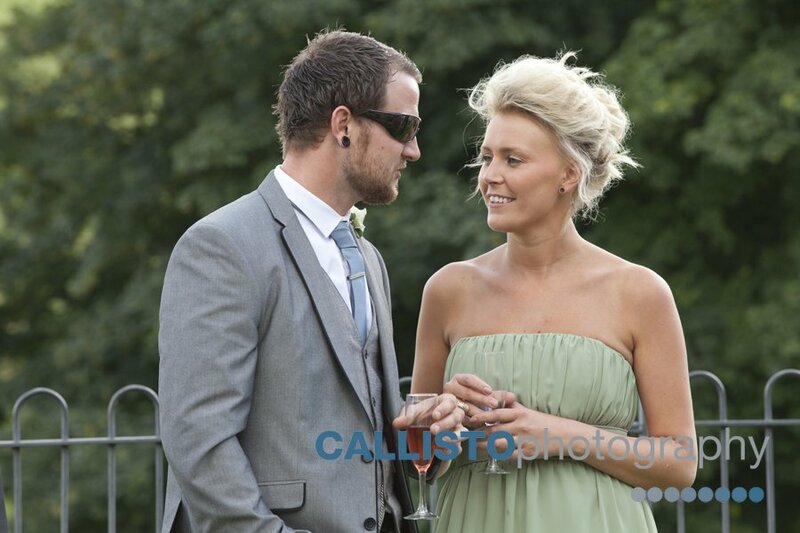 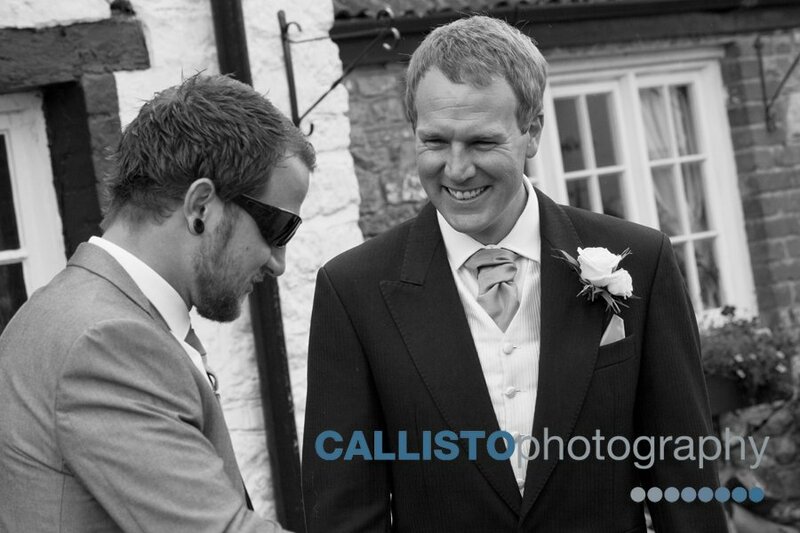 We had a great day photographing Becky & Chris’ special day and for a change, the ‘summer’ weather behaved itself! 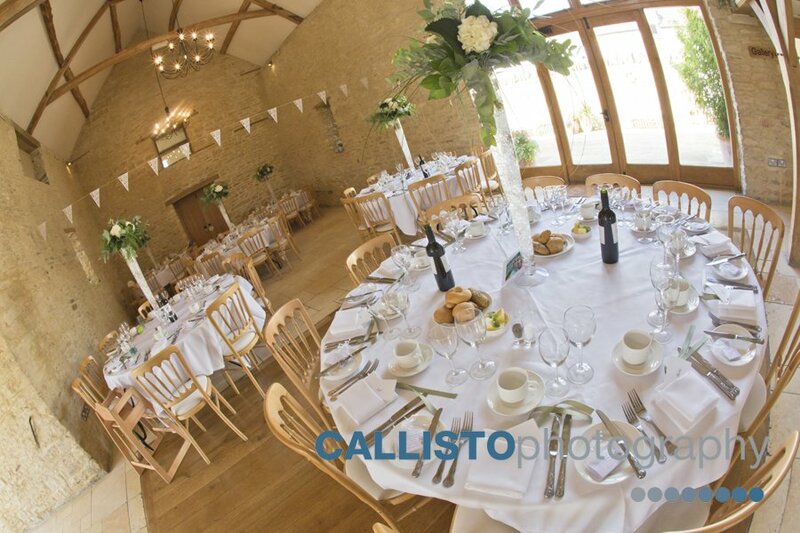 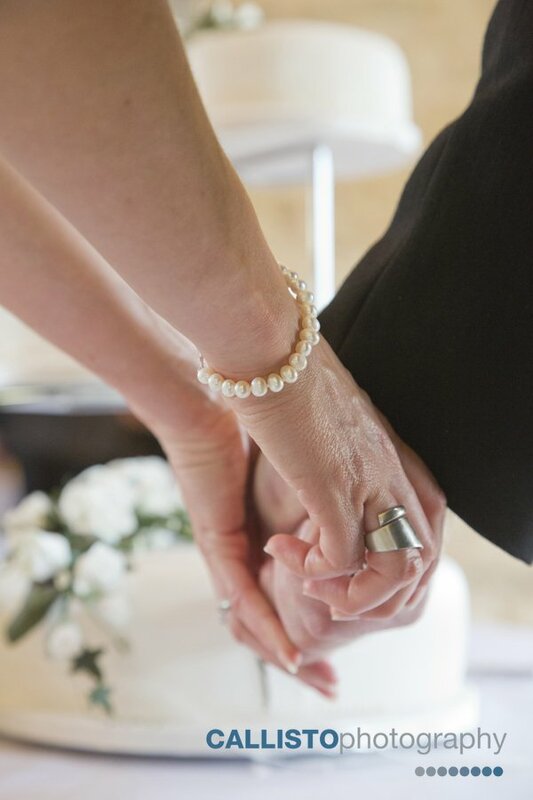 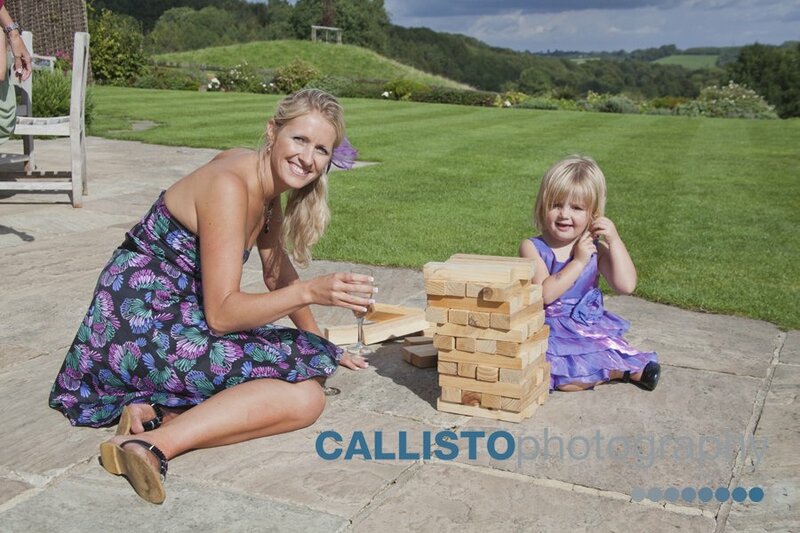 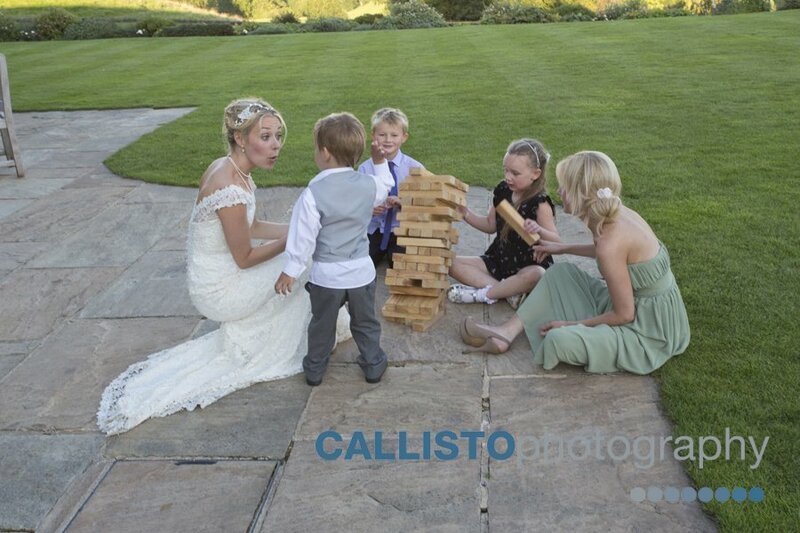 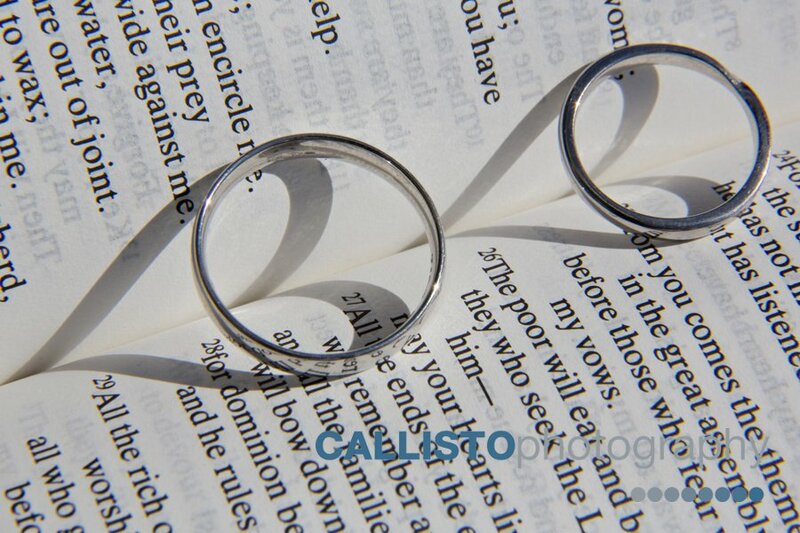 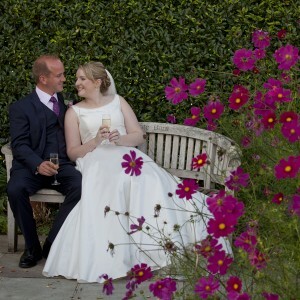 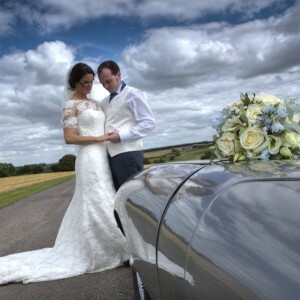 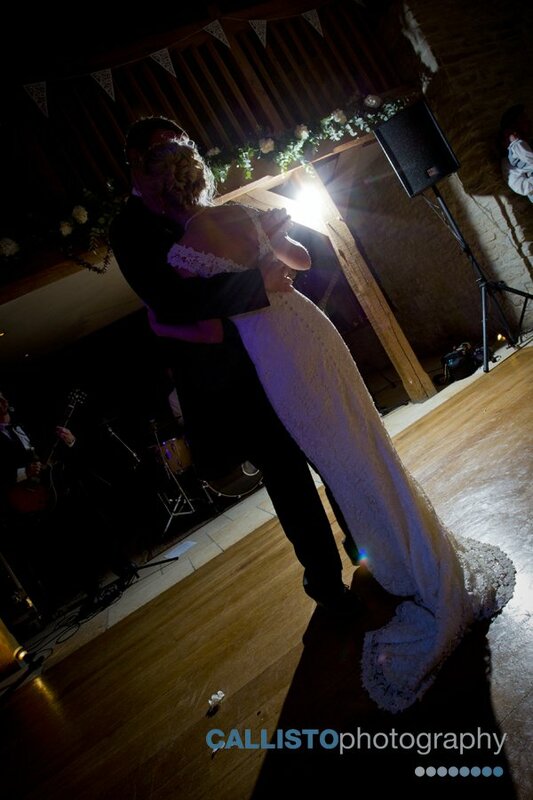 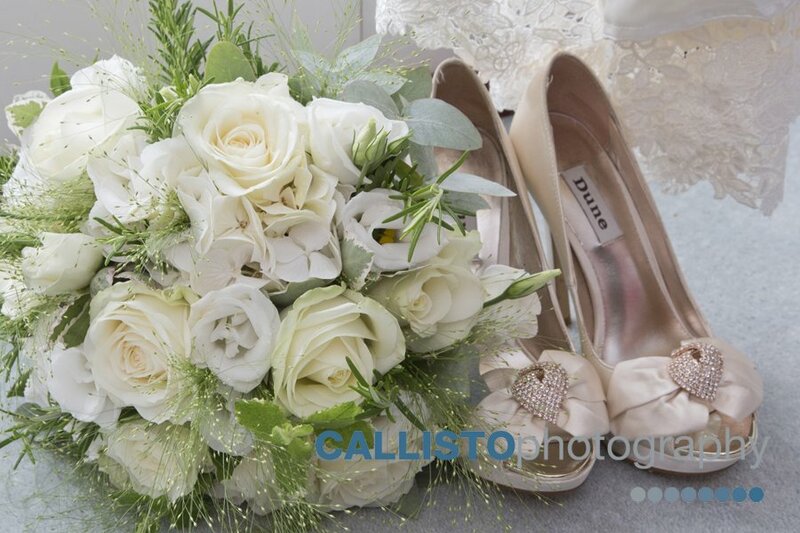 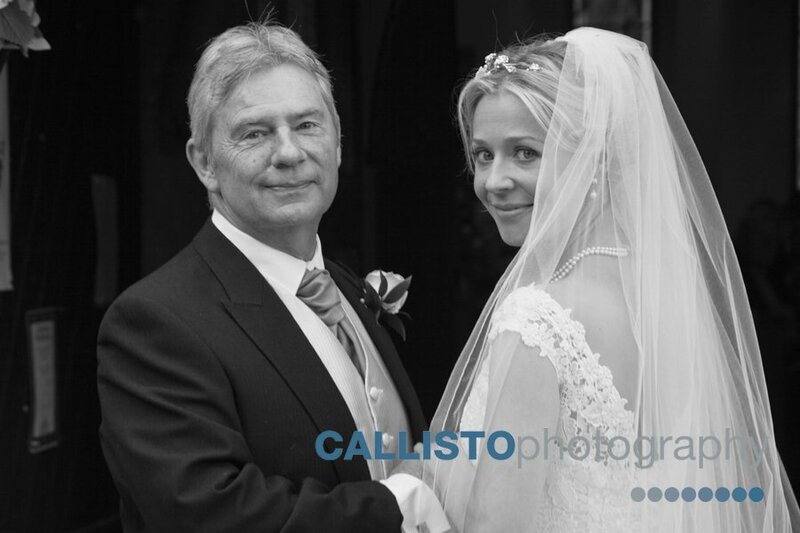 If you are having a wedding at Kingscote Barn, we’d love to hear from you.